As tensions with Iran continue, we meet the outgoing air group commander of one of the giant US Navy aircraft carriers situated in the area. The Persian Gulf, site of many conflicts, stands at the center of the current one between Israel and Iran. Israeli forces will no doubt have to cross the Gulf (and other Arab countries) if Israel decides to attack Iran’s nuclear facilities. Present in the Gulf as a force meant to deter Iran as well as protect the export of 40% of the world’s energy, is a US Carrier Group (also known as a “Strike Group) meant to provide security as well as serve as deterrent for any possible intent of attack by Iran or its proxies. President Obama's sending additional aircraft arriers to the Gulf has been widely publicized. Some have said that it was done to appease those calling for a harder line against Iran, but what are these ships actually capable of? 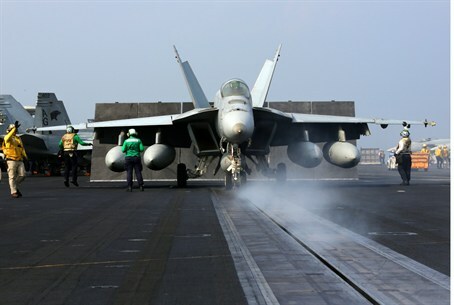 Arutz Sheva was given the opportunity to examine the issue firsthand by taking a ride to the USS Eisenhower, patrolling off the coast of Iran as part of the United States’ Fifth Fleet. The USS Eisenhower is part of Strike Group 8, tasked to the Persian Gulf and the Arabian Sea. The Eisenhower is tasked with many missions; among the major ones are anti-piracy to secure open shipping lanes, Close Air Support (CAS) for US forces, and serving as a quick reaction force in one of the most vital parts of the world's economy. Almost 40% of the world’s energy passes under its area of responsibility, something that makes it a strategic part of the ocean for the American Government, one that merits adequate protection. In the past couple of years much has been said about the Carrier Group’s capability as a deterrent against Iranian aggression, stemming mostly from the embargo put in place against the Islamic Republic, yet most of this is heard internally here in Israel. Outside of Israel, one of the Carrier’s more well-known roles is supporting US military action in Afghanistan, providing what is commonly known as CAS (Close Air Support), This action is provided from a significant distance and shows just how versatile this warship is and why it is probably the United States' ultimate game changer when it comes to laying down a hard line policy, if needed. Sorties are constantly going on throughout the day; the carrier is completely self sufficient and it provides the tankers to close the gap for the long trip to Afghanistan and back. Should the need arise, the Carrier can keep rotating and provide all types of weapons set to be used for any type of target. It has bombs to punch through hardened enemy positions or smaller anti-personnel munitions commonly used against infantry or terrorists, and, along with the Carrier travel Guided Missile Cruisers, such as the USS Hue City, is capable of firing Tomahawk cruise missiles which were the opening act of conflict in the liberation of Kuwait and Operation “Enduring Freedom” meant to eradicate the Taliban from Afghanistan. Additionally, the carrier can provide Electronic Warfare assets and its own radar detection for its aerial assets, which puts the Carrier in a class of its own in an age of modern warfare. The Carrier in a class of power second only to the Military force of a medium--to-large and well equipped country, and the US Navy owns 10 operational ones just like it. Whether the Carrier really acts as a deterrent against Iran or not, it definitely strengthens US relations with its allies in the region. It provides a show of force on a daily basis, which most surely is noted by the Iranians, whether or not they act against it. The Carrier and its assets have to skirt around Iran to get to Afghanistan and its capabilities surely are not unnoticed by the Ayatollah Regime.